Preview your text and other study materials before class to develop a big picture of what you'll be covering. Skim through the chapter, noting all headings, subheadings, bold words, graphs, pictures and summaries. Once you've developed a big picture, it will be much easier to remember and learn the detail. Attending class should be an obvious step, but some students don't take it seriously enough. Missing even a few classes can be detrimental to your studies and the learning process, especially in subjects such as math. Combined with previewing, attending class will allow you to get more from lectures and take better, more concise notes. Preferrably right after class, but at least sometime during the day, take about 10 minutes to review your class notes. This process of review transfers the information you learned during class from your short-term to your long-term memory. It also reinforces new concepts and increases confidence. To reinforce the new material you learned during class, and to make sure you thoroughly understand the subject matter being taught, take about 30-50 minutes to review your notes, read your text book, work problems, make concept maps, or form a study group. As you study, ask yourself 'how', 'why' and 'what if' questions. Dont't forget, repetition is the key. Reflect and evaluate your mastery and understanding of the material you learned and studied. Ask yourself, "Is the information I'm studying making sense? ", "Am I confident with the new material? ", "Do I understand the material well enough that I can teach it to someone else?" 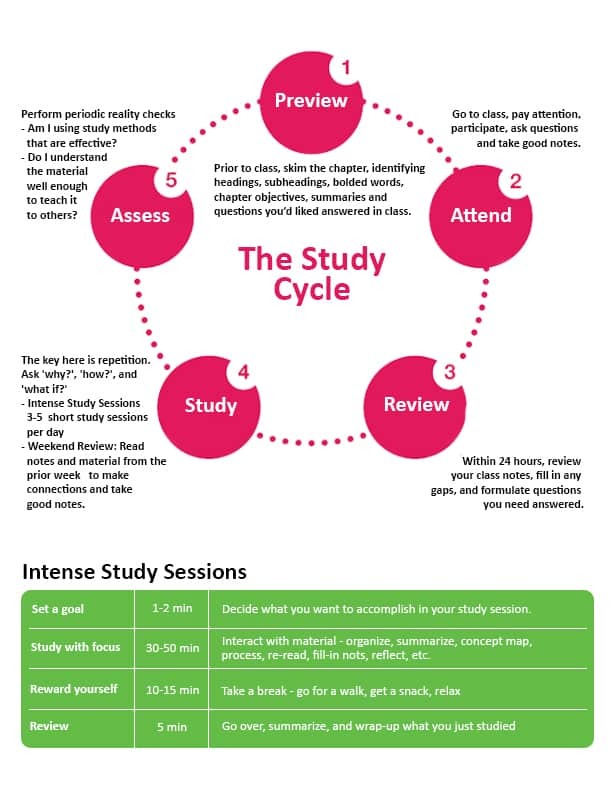 Assessing your studying from time to time is an essential aspect of learning.